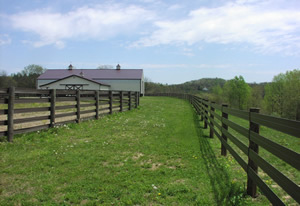 5.25" wide Horserail is a low-maintenance, long life fence and will handle abuse better than any other type of rail fence you can buy. Posts should be no more than 12 foot apart and the ends and corners must be braced well to handle the abuse this fence can take. Each rail has 3 strands of our top grade 180,000 minimum PSI heavy galvanized high tensile wire. Kencove stocks materials for several different options in brackets, splices and tighteners. Thirty year limited manufacturer's warrantyProudly made in USA!